You are here: Home / Owner’s Manual / Compliance / Hiring New Employees? Do You Know Your State E-Verify Laws? It’s difficult to know if these employers intentionally violated immigration laws. Regardless, the federal E-Verify system is in place to ensure that only those eligible to work in the United States are hired. This protects individuals from identity theft and other issues. What Are E-Verify Federal Regulations? E-Verify is a free, voluntary, internet-based verification system that allows employers to confirm employment eligibility of newly hired employees from information provided on federal Form I-9 that you include with your new employee forms. The program is operated by the U.S. Department of Homeland Security in partnership with the Social Security Administration. It is important to note that although E-Verify is considered voluntary on the federal level, employers still have an obligation to ensure they employ a legal workforce. In addition, many states have enacted their own laws making verification mandatory for some or all employers. How Do I Know if Employment Eligibility Verification Is Required in my State? You should also be aware that contracts with the federal government and many state, city and county governments require E-Verify for those contracts and subcontracts. Being familiar with those requirements is important as well. Why Is E-Verify and Employment Eligibility Verification Important to Me? Recent I-9 audit numbers are staggering. In 2007, ICE conducted approximately 250 workplace audits. In 2011, that number soared to almost 2,500. Employers can not only be penalized for violating immigration laws but can also be penalized for poor record-keeping. 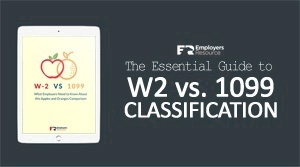 Are Your Managers and Supervisors Trained on Form I-9 and Other Federal New Employee Forms? Form I-9 and E-Verify go hand-in-hand so it is imperative that the I-9 be completed properly. With the recent unveiling of a revised Form I-9, it is important that all managers and supervisors involved in the hiring process be educated on how to obtain and record the appropriate information to complete the form. E-Verify may NOT be used as a screening tool. Employees must have accepted a job offer before completing the Form I-9. Employers may not use E-Verify selectively. For example, you may not only E-Verify foreign nationals or employees who provide a “green card.” If participating, all new hires must be verified through the system. On June 27, 2013, the U.S. Senate passed a bill to expand E-Verify nationwide along with overhauling other immigration laws. Within four years of the regulations being issued, all employers would be required to use the E-Verify system. It’s not likely that a national verification system will be mandated in the near future; however, additional states and municipalities are sure to pass this type of legislation. If you have specific questions regarding employment verification, Form I-9, or any other compliance issue, contact your Client Service Coordinator at Employers Resource. Not sure about the whole process? Use a PEO, Employers Resource is happy to help! Contact us today! https://www.employersresource.com/wp-content/uploads/2013/10/Hiring-New-Employees-Do-You-Know-Your-State-E-Verify-Laws.jpg 200 300 Employers Resource https://www.employersresource.com/wp-content/uploads/2016/07/employers-resource-national-PEO-strength-local-service.png Employers Resource2013-10-14 10:30:212016-10-12 15:01:18Hiring New Employees? Do You Know Your State E-Verify Laws?